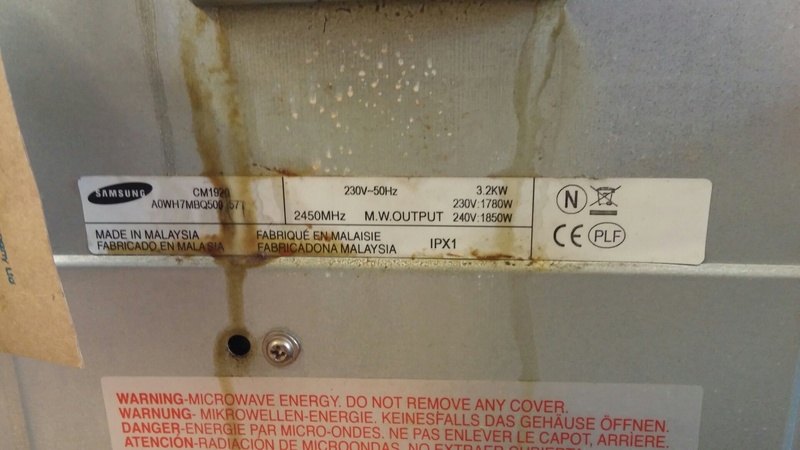 Just recently I have had a few phone calls from customers who have damaged their microwave by using it to warm plates. 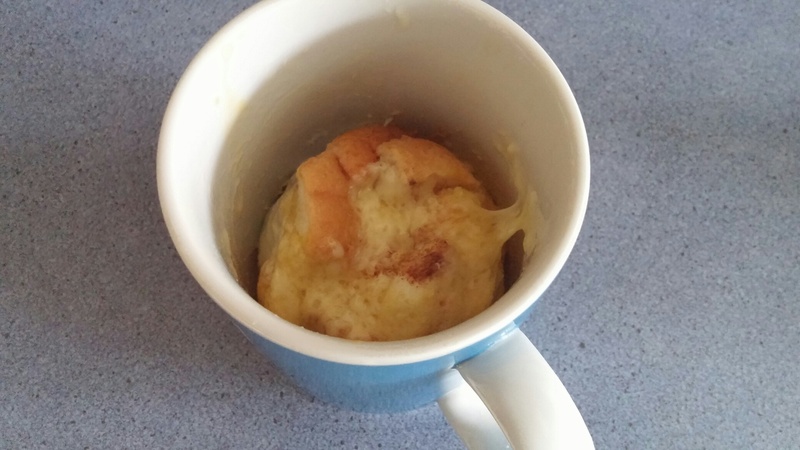 In a nutshell, don’t use your microwave to warm plates. Very briefly, microwave ovens work by emitting microwave energy into the oven. This in turn agitates water molecules in the food or drink in the oven. 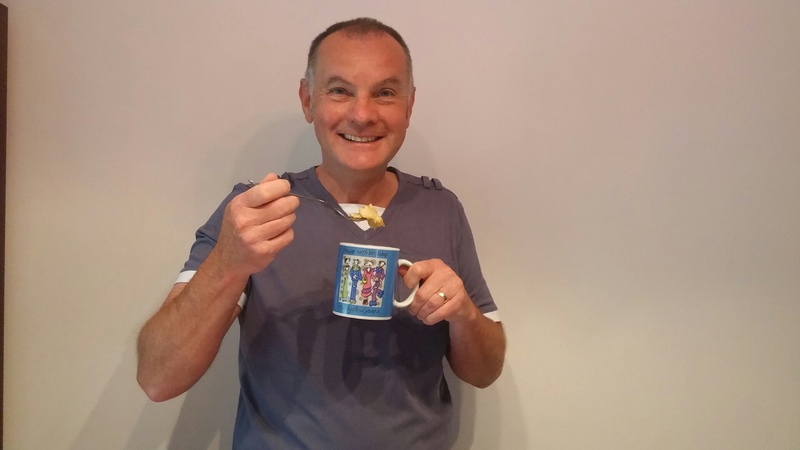 The friction of those molecules creates heat and – hey presto – hot food is the result. Plates have very few if any water molecules in or on them, therefore if you only put plates in the oven, the microwaves will bounce around the oven looking for something to absorb them. Eventually, something else in the oven will get warm. it might be the plastic roller ring, the mica waveguide cover or any plastic parts of the inner door. It may be that you have been doing this for a while with no problem, this could be due to a number of factors such as the quality or type of plate. Some cookware may have moisture inside which more readily absorbs the microwaves, whereas some cookware will be completely invisible to microwaves (this wont get warm at all). On a few occasions problems have occurred where the microwave is a replacement microwave and is either much more powerful than the last or through its design is less tolerant of microwave energy bouncing around inside. 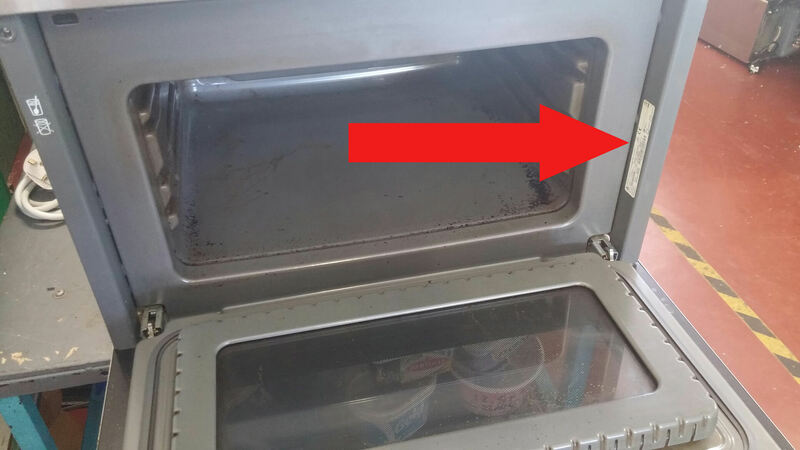 Either way, if the microwave is used for heating plates eventually some damage will occur. The plates could break. 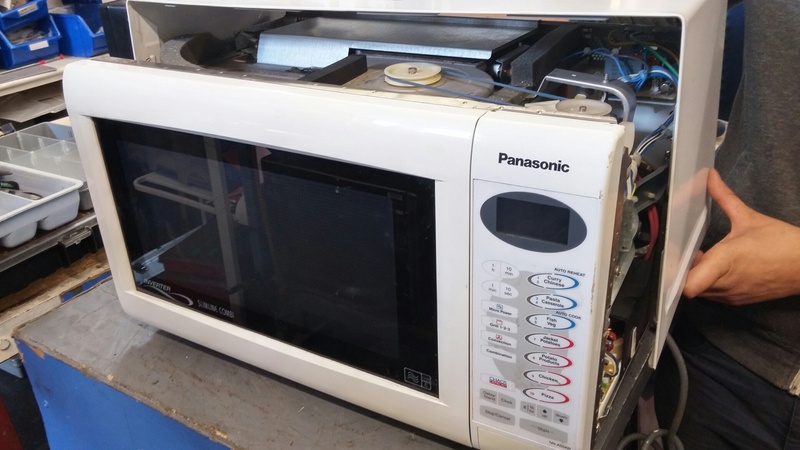 The microwave oven might even end up cooking itself ultimately which will of course result in costly repairs or replacement. 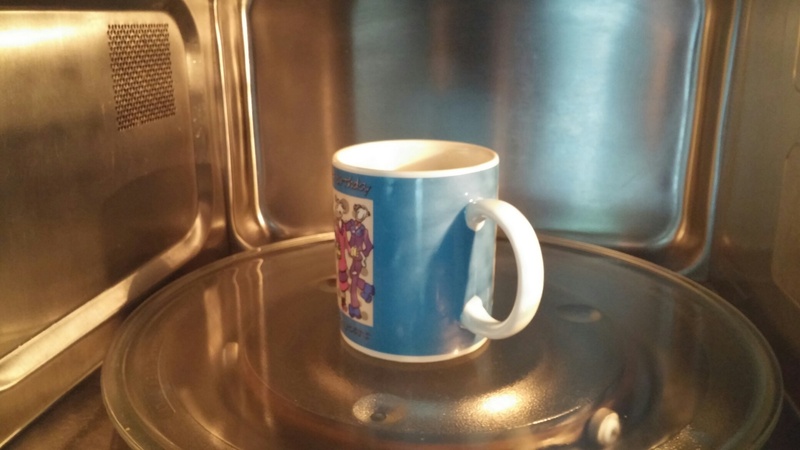 If you really want to use your microwave to heat plates try putting a bowl of water on top of the plates so that most of the energy will be absorbed or if your microwave is a combi oven warm the plates with the grill of convection instead. 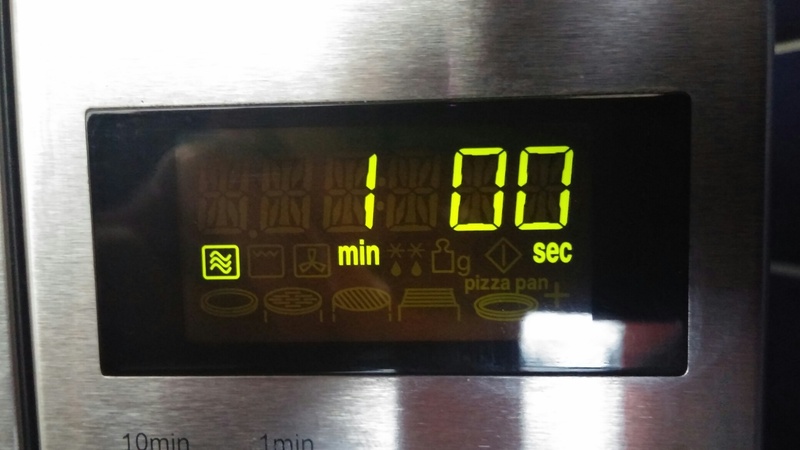 It may take 5 minutes instead of 1 minute but wont affect the microwave in any way. 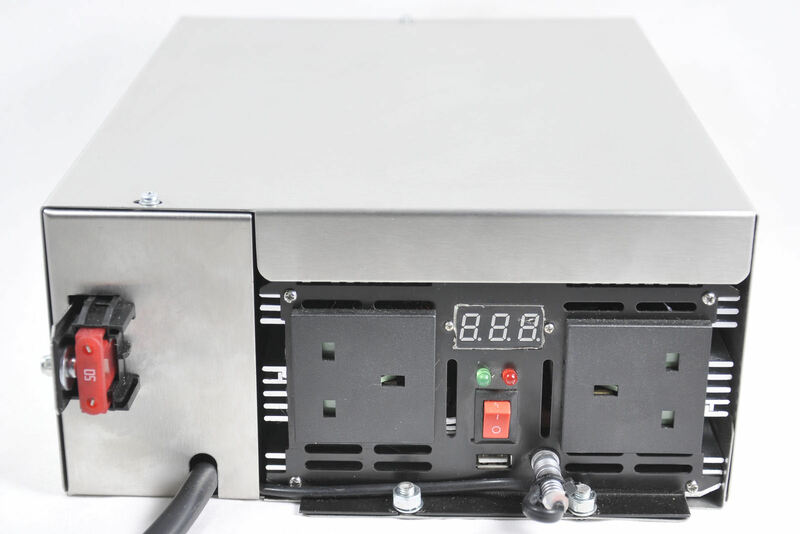 Following on from the introduction of our Drivemate 24 volt microwave oven earlier this year, we have found that the power supply (inverter) which was always available separately anyway, is actually more popular than the power supply and microwave assembly. 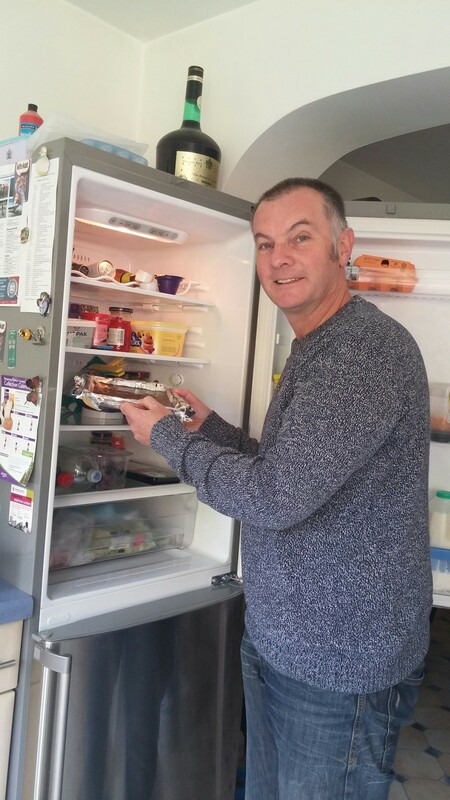 Because of its size, it can be fitted in one cupboard or suitable space and the microwave in a different place to make best use of truck storage cupboards. ● 1500 watts at 240 volts 50 Hz pure sine wave inverter (3000 watts peak). ● Rated supply voltage: 24 volts DC, maximum current 50 amps (fused). ● Over/under voltage protection: maximum 28 volts, minimum 21 volts. ● LED vehicle battery voltage indicator and control circuit (patent applied for). ● Two 240 volt three pin UK mains sockets with digital voltage readout. ● On/off switch for inverter on front panel. ● Suitable for 800 watt microwave ovens. 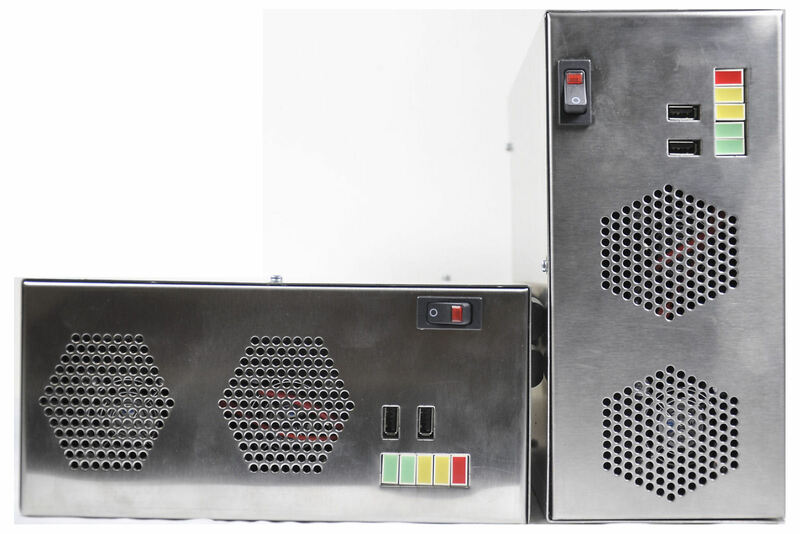 ● Stainless steel case with front air vents for cooling. ● Required supply cable size 4 AWG. ● 24 volts DC supply includes a 50 A Anderson (grey) connector. These are available to buy online or in our shop now. We are currently working on the added options of specific mounting brackets to mount the unit vertically or horizontally and have the option to buy a lead with a 50 amp to 175 amp connector to enable it to plug directly into the truck slave socket ( if located in the cab) for ease of installation. 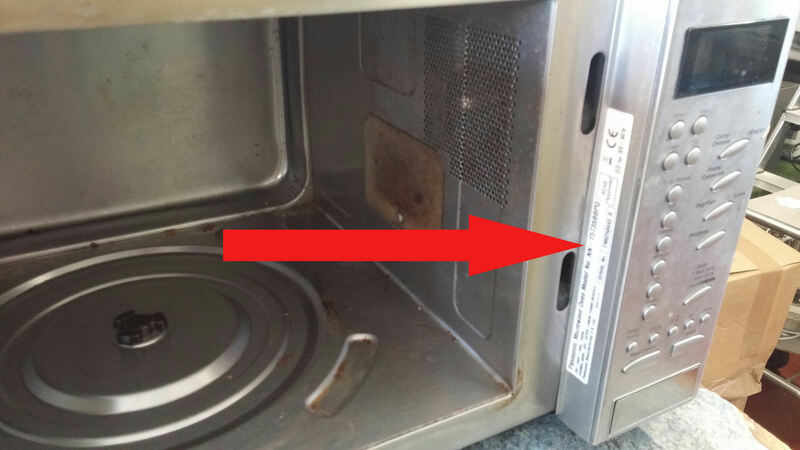 The interiors of microwave ovens do tend to rust over a long period of time. This can be due to a number of reasons, the main cause is the generally thin coating of paint is damaged by the continuous rotation of the roller ring, antagonised by spillages or condensation and the warmth of the oven create perfect conditions for rust. Rust is difficult to completely cure but certainly using our touch up kit and a little tender loving care can reverse the unsightly looks. Please read through these instructions and follow them carefully. Perfect results are not guaranteed but if you follow them carefully you will reduce the poor finish caused by rust and wear. Allow a period of time when you are not going to need the microwave, the paint needs at least 6 hours to dry before the microwave can be used otherwise the paint itself will heat up and spoil. Ideally unplug the microwave oven to prevent any accidents or risk of electrocution. Remove the glass tray and roller ring. Place some old newspaper in front of the microwave in case the paint drips. Rub down the affected area firstly with some coarser glass paper sheet and then some smoother grade (supplied in the touch up kit), to remove any loose flakes of paint and as much rust as possible. The smoother the prepared area, the neater it will look when finished. Wipe over the area and wipe out the oven cavity with a dry cloth to remove all dust, debris and moisture. Shake the tin of paint vigorously for at least 30 seconds and then open it with a small screwdriver or knife and stir thoroughly with one of the stirrer sticks. Using a paintbrush, carefully paint over the affected area. The paint does dry quite quickly. A better finish is achieved with several thin coatings of paint rather than applying a large amount of paint in one application. This also reduces the risk of unsightly blobs of paint. Once complete, leave the microwave oven unplugged with the door open for 6 hours at least to allow the best opportunity for the paint to dry. If the paint tin lid is pressed firmly back into place, it can be stored for many months. The stirrers supplied in the kit can be re used once dry. The brushes can be cleaned using turpentine or white spirit but we have supplied 2 in the kit with the view that it may be better to discard the used brush once used and then use the other if necessary at a later date. Paint contains Cobaltcarboxylat and Butanonoxim and can cause allergic reaction. Full specification upon request. 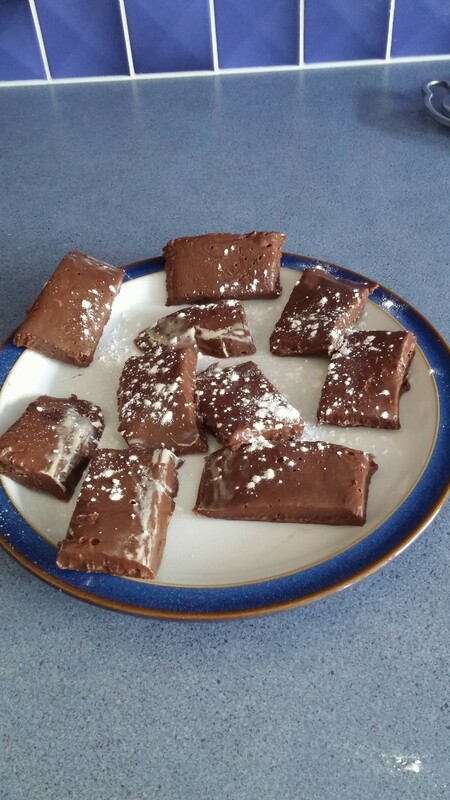 Microwave Fudge – probably the easiest and tastiest recipe ever. 350 ml of Condensed Milk. 300 grams of Chocolate drops ( any flavour) . 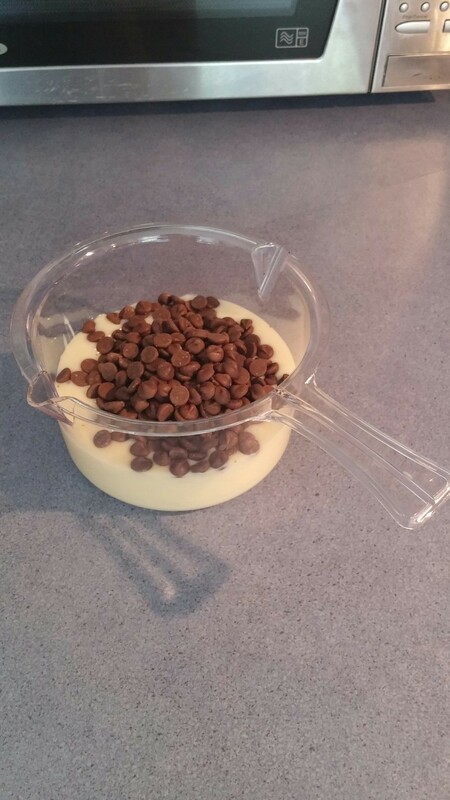 Pour the condensed milk and chocolate drops into a 1 – 2 litre microwave safe dish. 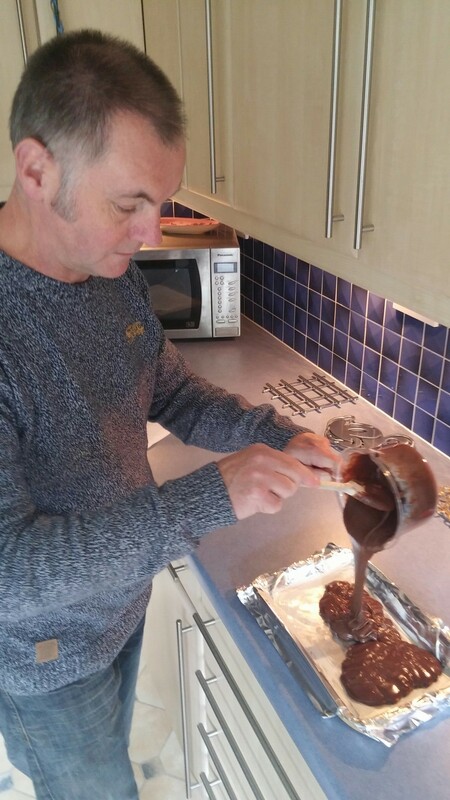 While that is melting line a baking tray with lightly greased foil. 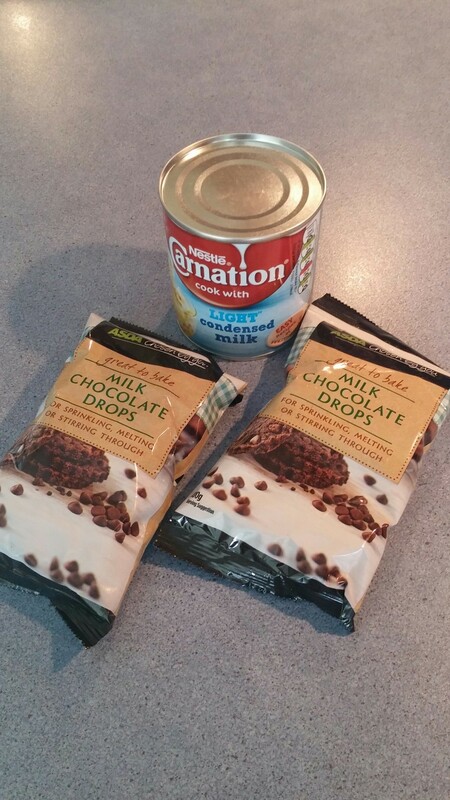 Although all of the chocolate drops may not have melted, stir thoroughly for a minute or 2 to ensure both ingredients are mixed. 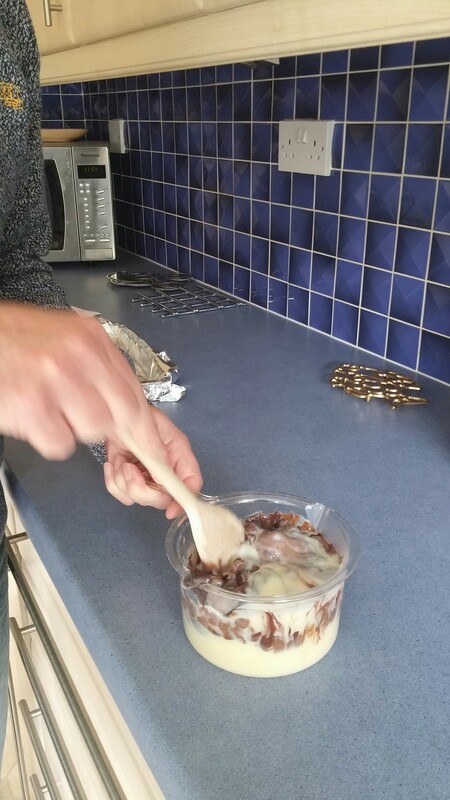 Pour mixture into tray, smooth out and place in fridge for a couple of hours. Turn out fudge. 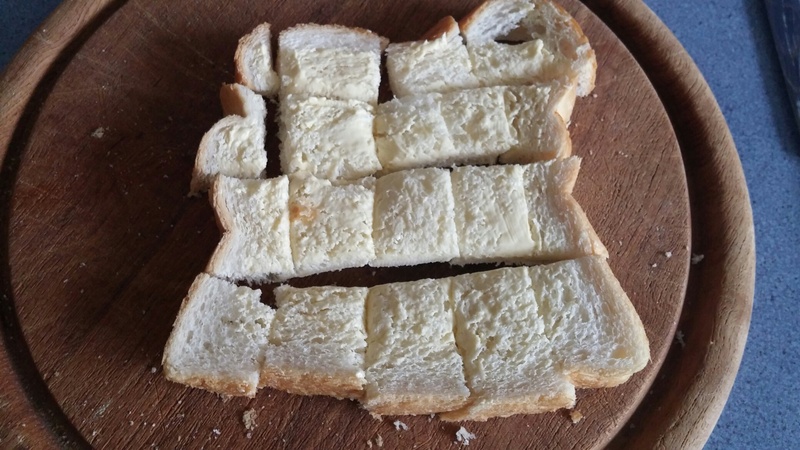 Cut into pieces and then decorate. Enjoy. 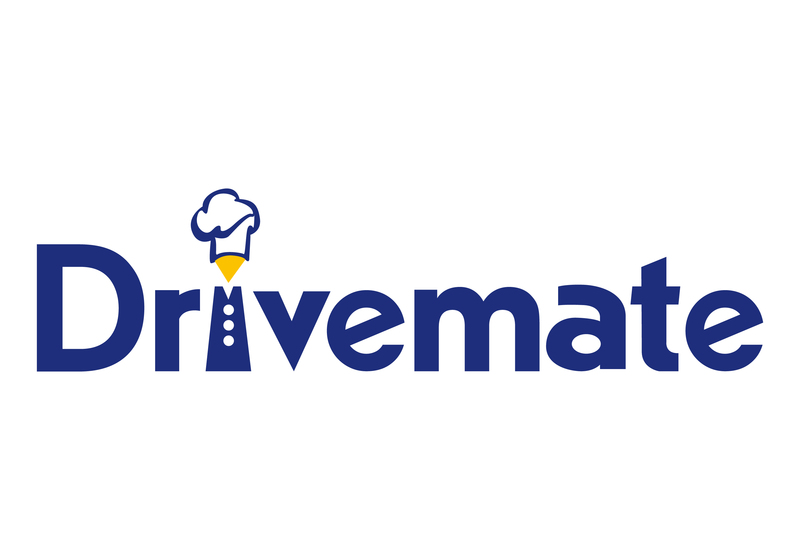 After nearly 2 years of work our new Drivemate 24 volt microwave oven is now in production. The picture shows the pre production prototype. Production models will have colour labels fitted to the front. It is a microwave oven and grill combination oven with its own built in power supply and control unit. The fused connections to the rear allow it to be wired directly to the vehicle batteries. LEDs on the front report the vehicle battery voltage and the control unit prevents operation with batteries that don’t have enough power to start the vehicle. There is an additional plugtop socket on the rear that can be used to run other small mains (240 volt AC) appliances instead of the microwave and there are 2 USB charging sockets on the front of the unit that can be used for charging phones, laptops or tablets. This will be sold as a complete oven ready to go. 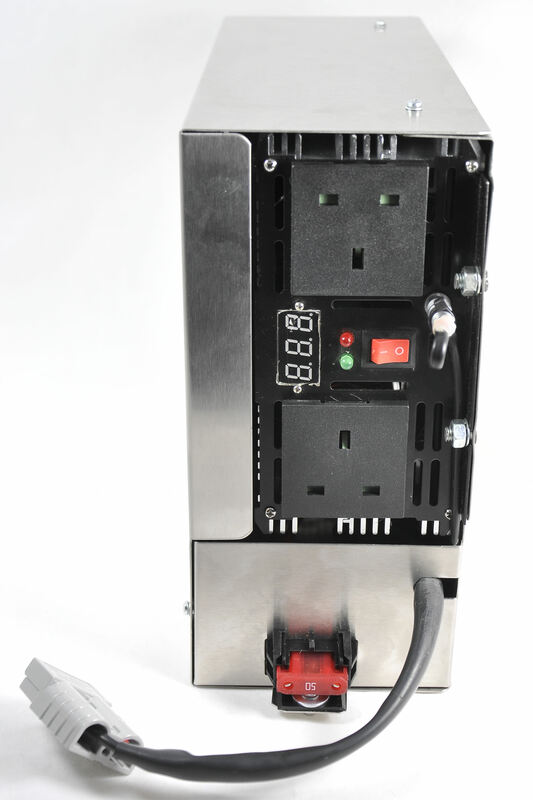 We will also sell the Power supply as a separate item that can be fitted in a different cupboard where the dimensions wont allow the whole drivemate to fit. Rated input voltage – 24 Volts DC – maximum 50 Amps. 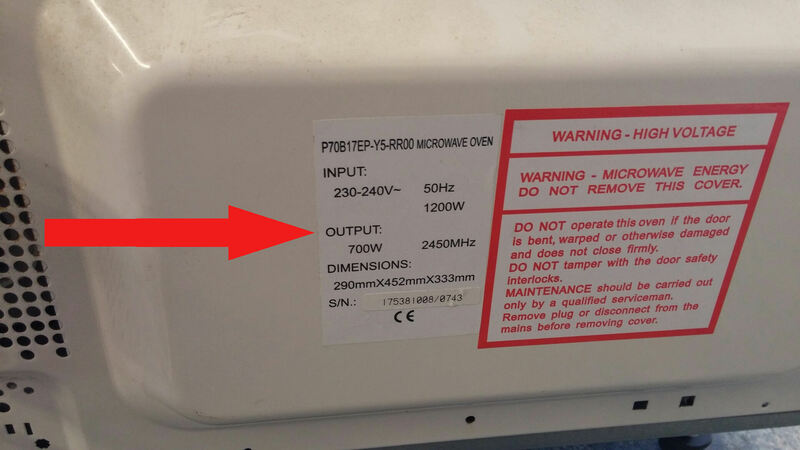 Rated input power (Microwave) – 1270 Watts. 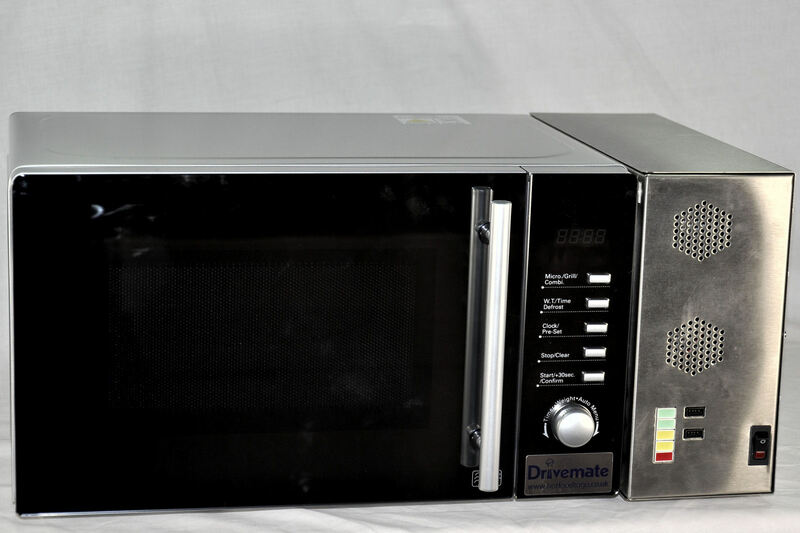 Rated output power (Microwave) – 800 Watts. Rated input/output (Grill) – 1000 Watts. Rated output power (USB x 2) – 500 Milliamps. Oven capacity – 20 Litres. Turntable diameter – 255 mm. Net weight – 16 KG. External dimensions – 530 mm wide x 250 mm high x 370 mm deep. Supply power cable required – 4 AWG. 50 Amp Anderson connector and 2M lead supplied with both oven and power supply version. We have started manufacture and will be shipping by the end of November. They are listed on our website for pre order. 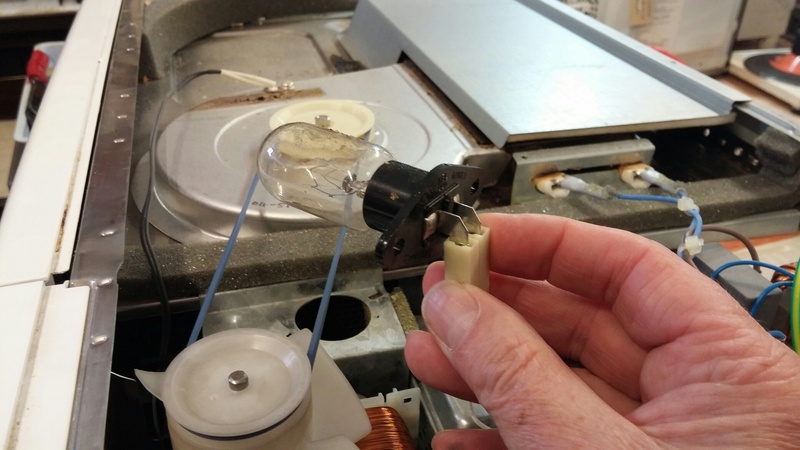 How to change the light bulb (lamp) in your microwave oven. Changing the Lamp is an Moderate process. The older models had a flap on the left hand side of the case. You simply unscrew this and remove the flap. Replace the bulb and then replace the flap and tighten the screw up. Firstly, turn the machine around and you’ll notice screws all round the case, remove these. 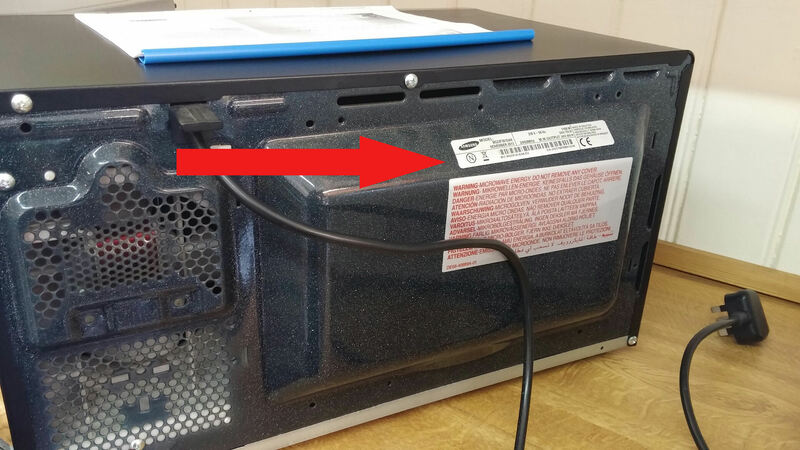 There may be some screws on the side of the case, remove these to. Pull the case towards you and remove. Depending on your model your lamp may be clearly visible on the left or right hand side. Many new models the bulb is quite well hidden. 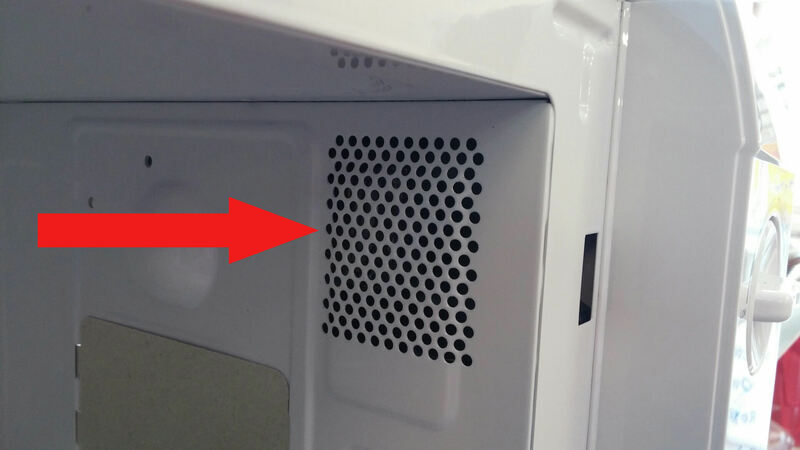 To find this either look for the base of the bulb or turn the microwave so its facing you, now look directly behind the control panel it will be there. the microwave bulb is located behind this drilled mesh but cant be accessed through this mesh. You need to get to it from the other side – behind the control panel. Remove the screw holding the lamp in/lift up the metal tabs holding the lamp in. Replace the case – You will need to slide the top in place, then the left hand side, then the right hand side. Replace all the screws and test your handy work out! 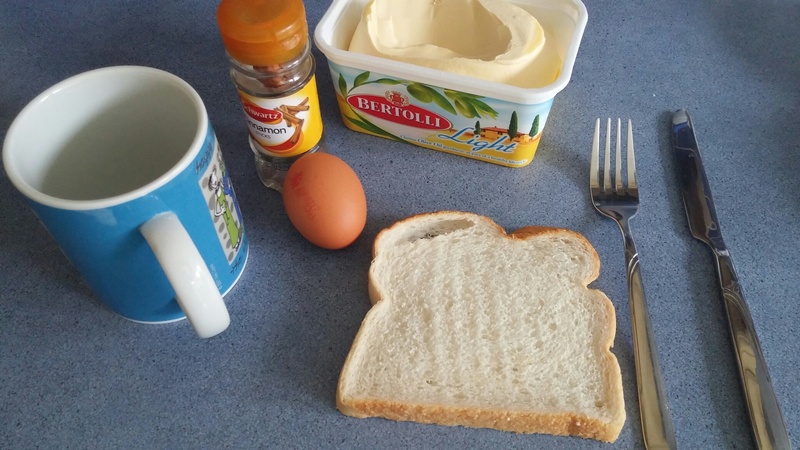 Just to show you how easy using your microwave can be I not only made this easy cooked breakfast at the weekend, but I photographed its making to demonstrate how easy it was. 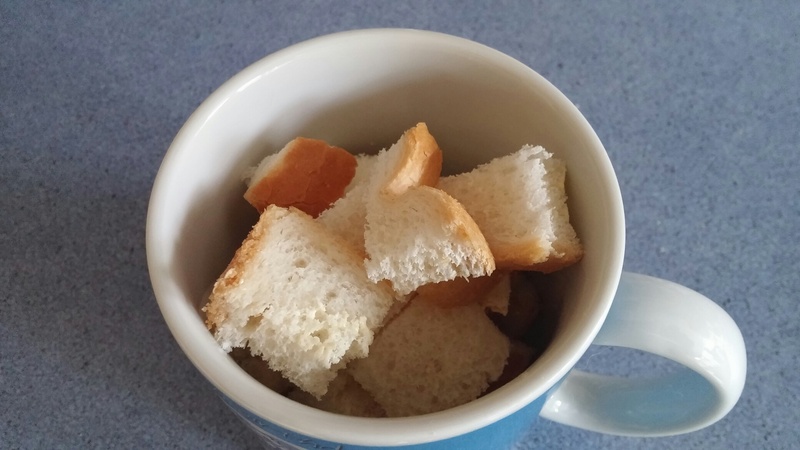 place bread into a large mug. 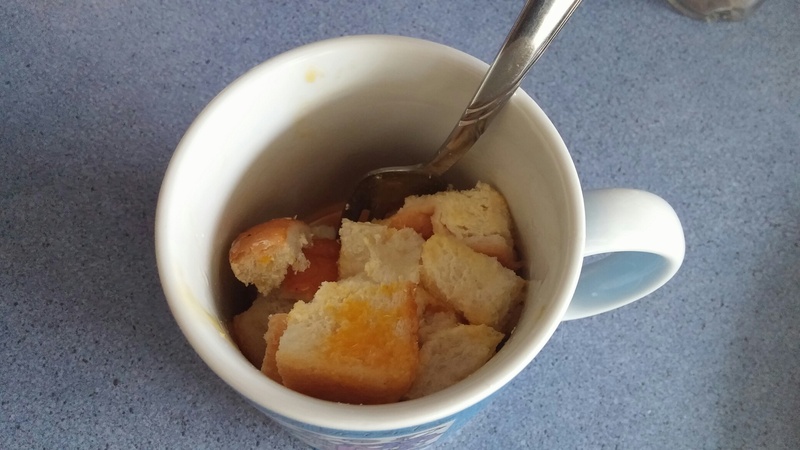 break the egg into the mug and mix with the bread pieces. cook on high for 1 minute, then stir and check egg is cooked. If not, cook for a further 10 seconds at a time. sprinkle with a little cinnamon or cheese or anything really. If you do add bacon it should be cooked first. 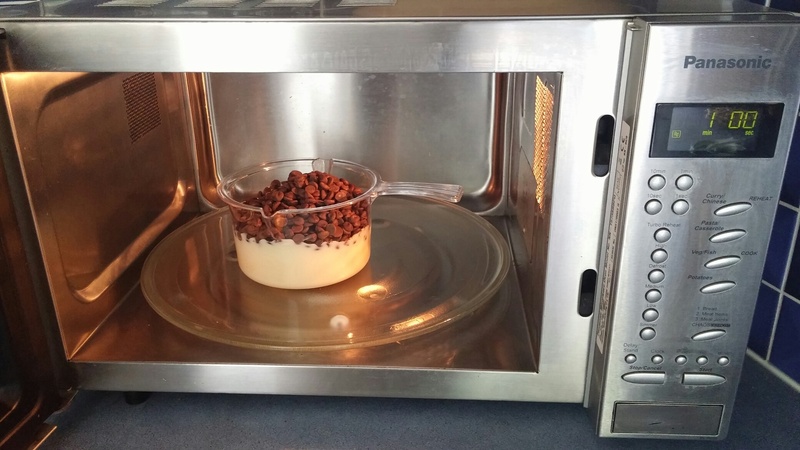 We are regularly asked about the use of foil containers in the microwave. Many shops supply frozen or chilled prepacked meals that can be reheated or cooked either in a conventional oven or in a microwave oven. They can, but with great caution unless familiar. 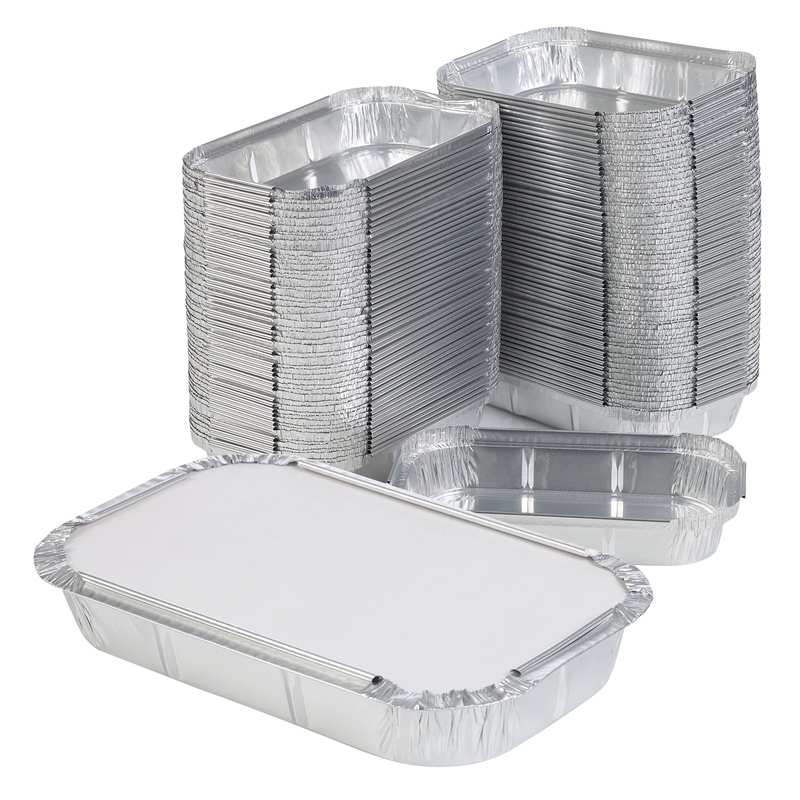 Use only shallow foil containers, no deeper than 3 cms. Use singly in the centre of the microwave glass tray to avoid getting too close to the oven sides. Do use normal precautions and stir microwaved food and ensure that it is piping hot before serving.